Swiss pharma Nigeria Limited (swipha) manufactures and marketspharmaceutical products that meet international standards. Swipha also distributes products of other international pharmaceutical companies like: Bayer AG, Germany (OTC Products) BIO-STRATH AG., Switzerland amongst others. Swipha has been in Nigeria since 1976 and has been supplying drugs to Federal Ministry of Health, State Governments and Parastatals. Continue..
Swipha also sells to the private sector and many of her products are household names in Nigeria. All the products manufactured in her plant at No. 5, Dopemu Road Agege, Lagos are subject to current Good Manufacturing Practice (cGMP) and Good Laboratory Practice (GLP) for Quality Control. Swipha has always been in the forefront of quality in her systems, processes and products. In 1993 swipha embarked upon a companywide implementation of Total Quality Management ( TQM) as part of her continual quality improvement. This strategic move helped to entrench quality as a culture in the organization. The effect of this on the performance of the company was remarkable. As time went by the Management of swisspharma Nigeria Limited(swipha) decided to embark upon ISO:2000 QMS Certification for her Quality Management System. This was at a time that many other companies made do with basic quality standards. In the year 2004, swipha became the first in the Pharmaceutical Industry in Nigeria to attain this certification which further entrenched her leadership in quality systems and products. By then swipha has built an enviable reputation of quality which was acclaimed by professionals in the healthcare delivery system of the country. Buoyed by the attainment of the ISO 9001:2000 QMS Certification, swipha went ahead to obtain a higher version of the certification which is NIS ISO 9001:2008. Swipha developed a corporate philosophy that nothing being done is “too good” that it cannot be improved upon. Recognizing that change is a constant thing in life, swipha braced up for higher challenges. About this time, many Global Donor Agencies were procuring pharmaceutical commodities from Europe. These were deployed to many countries of which Nigeria was one. However, proposals sent to some of these agencies soliciting patronage by swipha were not granted on the basis that they source products only from WHO GMP Certified companies. At that time only two companies in Africa were so certified. Swipha saw this as a challenge. In 2006 the Management of swissPharma Nigeria Limited (swipha) decided to pursue WHO Prequalification for her Anti-malarial product – DART (the first of its class to be produced in Nigeria). Then Nigeria had just launched a new Treatment Policy Guideline (2005) for the treatment of uncomplicated malaria which did away with the first line products (Chloroquine and Sulphadoxine/Pyrimethamine). Also, all monotherapies were to be dropped. On her own volition, swipha discontinued the production of her then newly introduced anti-malarial (ARENAX 50mg) which was also the first of its class to be manufactured in Nigeria. From then on, a flurry of activities and projects followed. In 2008 a major modification/modernization of swipha’s manufacturing factory/laboratory commenced. This led to a complete redesigning and upgrading of the plant and lab to modern internationally acceptable standards. The company also embarked on acquisition of modern machines and laboratory equipment to complement the new factory. At this point, the company had to engage international consultants to carry out preparatory third party audits with WHO pre-qualification in view. This, as can be imagined , was a slow but steady push as the company was going it all alone in a resource poor environment. This was the situation until 2012 when the leadership of NAFDAC in collaboration with PMG-MAN convinced the WHO to initiate a new concept which was piloted in Nigeria for the organization of GMP Inspections as a follow up of Technical Assistance. This concept involves organizations of pre-submission of GMP Audits by WHO Pre-qualification team (WHOPQT) Inspectors to verify status of compliance achieved during previous Technical Assistance, although completion of data to be submitted for pre-qualification in line with international standards is still ongoing. Swipha was selected as one of the eight companies in Nigeria shortlisted for a GAP Analysis to ascertain the level of compliance to the WHO cGMP standards based on initial evaluation of her Site Master File. This heralded series of Advisory Audits by NAFDAC to further enhance compliance to WHO cGMP standards and preparedness for the final WHO cGMPInspction which took place in April 2013. A further verification inspection was carried out in October 2013. By this time, most of the identified GAPS (Non-Conformances) has been closed. It is important to note that throughout the inspection and close out of GAPS, no critical observation (defined as a major violaton of GMP Standard or Guideline) was observed. The other remaining non-conformances were closed out and further verified by NAFDAC in February, 2014. On April 2, 2014 the World Health Organisation (WHO) declared swipha’s Manufacturing and Laboratory Facility as being compliant to the WHO cGMP. This brought to a temporary end the“journey of a thousand miles” and placed swipha (and indeed Nigeria) on the world map as the First company in West Africa to be so acknowledged. This feat is indeed an attestation to swipha’s commitment to quality. It has further instilled more confidence in the consumers with regards to the products manufactured by swipha. It is therefore expected that swipha’s products will be patronized more than ever before. A window of opportunity is also opened for quality conscious international donor agencies and governments to procure from a Nigerian Pharmaceutical Company drugs intended for use in Nigeria and Africa. Swipha’s drive for export is further boosted as her reputation now goes beyond Nigeria. Equally contract manufacturing business for multinationals which swipha had been hitherto engage in is expected to increase in volume and numbers. Indeed the journey holds a lot of promise as swipha is determined to remain a top quality key player in the industry. When i hear swipha, i think drugs. Pics of their facility nko? Abi na grammer dem wan knack us only. 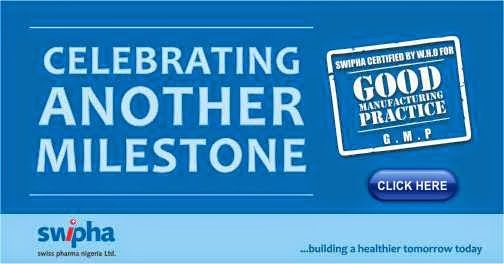 Congrats Swipha cos getting cGMP certification aint easy. It's very encouraging to read news like this about Nigeria. As a pharmacist in the UK, I more than ever want to go back home and contribute positively to the growing economy. Congratulations Swipha! It is very encouraging to read news like thus about Nigeria. As a pharmacist based in the UK, I so much look forward to coming home and contributing positively to the economy of our nation. Congratulations Swipha! !